Singlish is the English-based creole or patois spoken colloquially in Singapore. Although English is the lexifier language, Singlish has its unique slang and syntax, which are more pronounced in informal speech. While English is one of Singapore's official languages, Singlish (a particular dialect with its unique intonations and grammar) is commonly regarded as having low prestige. The Singaporean government and some Singaporeans alike heavily discourage the use of Singlish in favour of Standard English and Standard Mandarin. The government has created an annual Speak Good English Movement to emphasise the point. Singlish is also heavily discouraged in the mass media and in schools. However, such official discouragement and routine censorship is actually countered by other presentations in mainstream media, including routine usage by ordinary people in street interviews broadcast on TV and radio on a daily basis, as well as occasional usage in newspapers. You should be able to figure out the other words by yourself — except the last one, "one", which appropriately comes with three question marks, because, even though it is ubiquitous as a sentence final particle in Singlish, there is no consensus with regard to its derivation, meaning, and function in this position. "Singlish Lesson 1 – 'One'"
Can any other language match that colorful one quoted above for profusion of code switching within one relatively short sentence? BTW, although "Chinese helicopter" was included among the 19 new Singlish terms in the OED with the supposed meaning "a Singaporean whose schooling was conducted in Mandarin Chinese and who has limited knowledge of English" , none of my Singaporean friends has ever heard it used that way (see here). However, since the OED provides quotations from 1981, 1985, 1997, and 2008, perhaps it has simply already gone out of common use. Via Rebecca Starr on Facebook comes this wonderful example of Singlish in charades form. More videos of the charades competition are on the Hood Champions FB page. A fine and noble language! 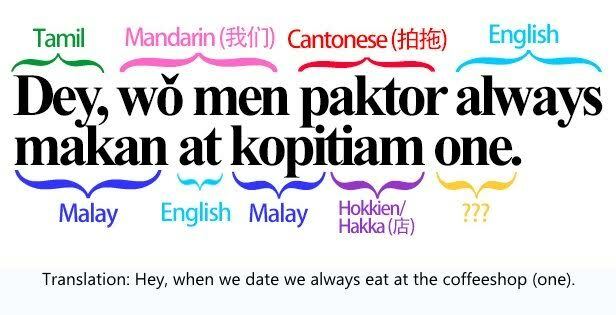 Amoy Hokkien was the most widely spoken language in Singapore when I worked there in 1971 (outside of, possibly, English) and a lot of things came from a Malay-influenced form of it. There were also the Hokkien literary readings–basically Tang Dynasty court language preserved in a semi-fossilized state. Horse in regular Amoy is be, but in literary readings it's ma (I forget the tone but not the Mandarin one). People would often think these literary readings were "Mandarin," confusing Mandarin speakers who were not from Singapore. Fascinating. I'm a little skeptical of the claim of Bengali influence in Singlish. From what I can gather, Bengal doesn't at all appear to have been a significant source of immigrants to Singapore. I heard about "helicopter" in 1980 or 1981, when I was teaching in Singapore, from university students. If it was a real usage at all it was probably more student slang than Singlish proper. "Helicopter" was for the graduates of Chinese-medium schools and "Apollo" for those from English-medium schools, who were the ones who volunteered it. I can't remember the proposed etymology if there was one, for either, and I don't think I ever heard anybody use it as opposed to describing it, in the ten years I lived in Singapore. But that was when Chinese as a "first" school language was being phased out, and the expressions would have lost their meaning in the university context. I wonder if "helicopter" has some snobby reference to spiky "durian-head" haircuts associated with Chinese schools. The very impressive A Dictionary of Singlish and Singapore English, launched in 2004, has an extensive entry for "Chinese helicopter". I'm a born and bred Singaporean in my late thirties, and I must say that I was quite amused by the recent inclusion of Singlish terms in the OED. However I also hasten to add that at least one addition, "Chinese helicopter", left me rather baffled, because I have never ever heard it used before, not even in the army where I was in for two and a half years. I must also point out that the "Dey, wo men…" sentence in the above post is a caricature. For one thing, I've never heard anyone use "Dey". That extent of mixing languages in regular speech is also rare. Regular Singlish isn't so "thick"; in fact there is a broad spectrum from "thick" Singlish (perceived to be spoken by the less educated) to almost perfect English (with probably a few Singlish words or phrases injected here and there). I have lots of Singaporean friends who are highly educated, but still love to speak Singlish in appropriate circumstances. Of course, they are also able to speak "perfect English" when called upon to do so, but that's another language. One is used as an emphatic particle in another "topo"lect of English: internet slang! Example: "Half-Life 3 is coming out next month!!!1!!one!" The origin is people typing multiple exclamation marks in a row accidentally releasing the shift key too early (the spelled-out "one" is sarcastic). I spent four months in Sri Lanka in 1984. "Singlish" was used to denote the melange of Sinhala and English. While Max is right, that's not the "one" used here. I was always under the impression it was a translation of Chinese 的, as in 那個高的 – "that tall one". "Yaya papaya"? Terrific. In German, fussy, picky, princessish behavior is "etepetete" (pronounced more or less as "ate a potata"). Kopitiam is common in both Malay and Indonesian. Very interesting indeed. Singlish "one" seems to act pretty similarly to the 是…的 structure in Mandarin, which can be used for emphasis. The emphasis falls on the phrase directly after 是, even though the 是 itself is optional in many constructions. I'll take the examples from the Singlish Lesson 1 – 'One' video linked from Viktor's post and see how they work in Mandarin using a sentence-end 的. For examples 2 and 3, the 是…的 construction is not necessarily providing emphasis, but is there more for syntactic reasons. I should note that I'm not a native Mandarin speaker, so take this with a pinch of salt. Is it possible that the various Indian language groups used Bengali as a lingua franca, much as the "Anglo-Saxon" (and Jutish, Frankish etc.) invaders of Dark-Age Britain included relatively few Frisians, but (allegedly) used the common language of the coastal-trading Frisians, such that Frisian is the closest modern relative of English? Am I correct to understand that English creoles are classified under English in linguistic classification, and that generally speaking, creoles are classified as being in the same family as their lexifier?